Over the years, the demand for energy has registered exponential growth rate. To bridge the energy demand supply gap, energy storage systems are getting deployed in all major countries across the globe. Traditionally, fossil fuels were used to meet this requirement, however market is now evolving towards renewable energy storage systems where electrochemical storage systems are primarily used. As India's quest for green energy is growing due to government initiatives and rising awareness, the market for renewable energy storage systems would record significant growth in the coming years. With current government plans and pipeline projects, the capacities of wind and solar would surpass hydroelectric capacity. In India, renewable energy storage systems market is at very niche stage. The market is expected to witness robust growth in the coming years due to declining storage cost and rising government initiatives to deploy renewable energy storage systems by offering various incentives and monetary subsidies. According to 6Wresearch, India Renewable Energy Storage Systems (RESS) market revenue is projected to touch $3.32 billion by 2022. Solar based energy storage is anticipated to capture major revenue share of the market. Electrochemical storage is currently driven by secondary (Lead-acid and Lithium-ion) batteries, which would maintain its market leadership during the forecast period. Amongst all applications, utility segment would hold key share in the overall India Renewable Energy Storage Systems Market. The report thoroughly covers the India Renewable Energy Storage Systems Market by technology, application and regions. The report provides the unbiased and detailed analysis of the on-going trends, opportunities / high growth areas, market drivers which would help the stakeholders to device and align their market strategies according to the current and future market dynamics. Increasing government initiatives to generate power through renewable energy coupled with need for cost efficient power back up have increased the market for renewable based energy storage systems. 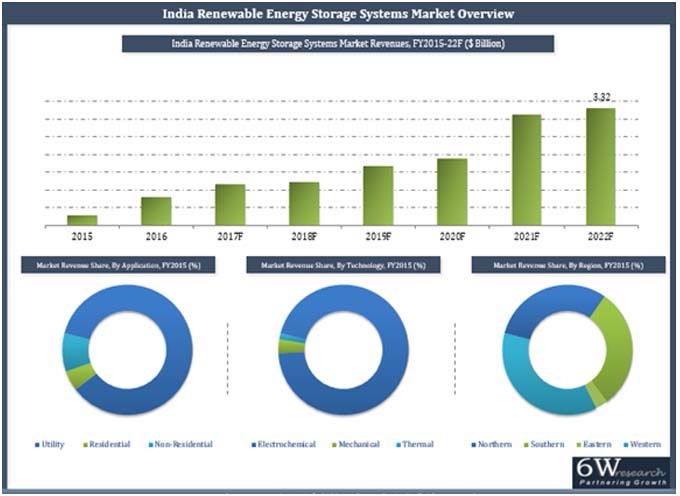 India Renewable Energy Storage Systems (RESS) market is projected to reach $3.32 billion by 2022. India Renewable Energy Storage Systems Market report has been segmented into various types, capacity wise, applications and regions wise. The major companies in India renewable energy storage systems market –Panasonic, Exide, Amara Raja and AES Corporation.